Das is aber ein guttes idea! I came across an article in the New York Times this weekend that I thought you might like to read. 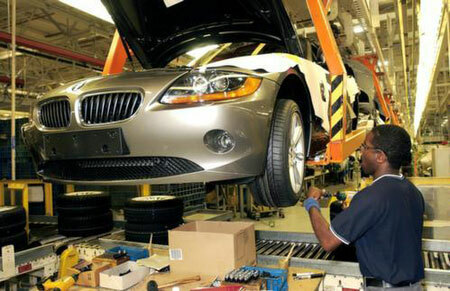 It concerns efforts in South Carolina to promote apprenticeship programs to train young people for jobs in manufacturing such as at the BMW plant in South Carolina pictured above. I really urge you to read the article, since it discusses important issues around getting our young people trained for today’s manufacturing jobs. As the article points out, creating apprenticeship programs has been hobbled in this country in large part because of “a longstanding stigma attached to vocational education”. This stigma has led in part to the bizarre idea that every young person in this country should get a degree from a four year university. Never mind that the annual cost of attending a university is over $15,000. Never mind that half the students to enter college don’t get a degree within six years. Never mind that the average amount of debt college grads are saddled with is over $35,000. And never mind that over 50% of recent college grads are either jobless or underemployed in positions that don’t require a sheepskin. I think it’s cool that the person making my drink at Starbucks can critically analyze Faust, but I bet they don’t. So I say less college and more apprenticeships. Why anyone would stigmatize someone for working in a job that uses their hands as well as their minds is beyond me. And guess what? Most college grads in this country don’t shuffle off to the opera or the library after work. They go home, get some pizza and watch football or American Idol. A college degree doesn’t make you a better person. The person you really are is determined by your character and what you do for others. Where you happen to work isn’t in the final analysis all that important. You co-workers can be angels or humps regardless of whether you work in a factory or on Wall Street. Actually, the odds are probably better that you will be surrounded by humps if you work on Wall Street. So don’t work on Wall Street! Work on Main Street. But before you can work on Main Street you need the skills. And apprenticeship programs can offer you those skills. So become an apprentice. Like Jesica Bush from my home state of Washington. Who was in prison, turned her life around, began an apprenticeship and is now well on her way to becoming an iron worker. Jesica’s story is inspiring and I hope you read about it. If you are interested in reading more about the promise of apprenticeship programs, I urge you to read a detailed study on the subject just published by Center for American Progress. Now get studying and then get working! This entry was posted in american made, Education, Made in America, made in usa and tagged Apprenticeship, apprenticeship programs in america, BMW, Made in America, Made in the USA, South Carolina. Bookmark the permalink. 2 Responses to Das is aber ein guttes idea! Um … whatever you may have intended to express, the title is in no existing language.